Have I mentioned how much I admire Alice Currah? Not only is she a wife and mother of three, but she also maintains two blogs (Savory Sweet Life and Everyday Alice) and is now a contributor to PBS’s Kitchen Explorers. How she finds the time to do all these things, I will never know. As impressive as those time management feats are, they aren’t why I admire Alice. I admire Alice for speaking difficult truths, for honoring her own convictions, for owning her opinions, for encouraging others to follow their passions, for being both a vocal critic and an ardent cheerleader, for reminding us to be authentic, and for being one of the warmest, most welcoming people I have ever met. I truly feel lucky to have met her in person and seen the passion she has for what she does and for this community of food bloggers. When I read her Tuna Casserole post on PBS Kitchen Explorers, I ached to have it as part of the Food Memories project. She eloquently conveyed how her food memories played a huge role in her life. I connected with this story in a lot of ways and I really loved how she honored her early experiences with food. I am honored that Alice is allowing me to share it with you here. Cooking and baking has always been a part of who I am. My mother and father had to work twelve hour days to put food on the table. Having six kids was challenging and they did their best to make sure we were clothed, fed, and had a roof over our heads. The food wasn’t glamorous but it sustained and nourished our bodies. My mother would often prepare a big one pot dish before leaving for work, which would be waiting for us on the stove top for dinner. Most of the time these dishes were very basic and accompanied by warmed rice made in a rice cooker. Although our family certainly qualified for public assistance, the prideful part of my father seemed to always override the need for more food in our cupboards. Nevertheless we managed, partly because of my resourceful grandmother who would occasionally bring us bags of groceries she received from the local food bank; bags of canned and boxed goods in white labels with black letters. These canned and boxed government issued foods would become my pantry, which started my love affair with cooking and baking. I had to be resourceful, creative, and flexible – a philosophy which would apply to every aspect of my life including working in the kitchen. My mother was not home to teach me to cook, but watching cooking shows on PBS planted seeds in my heart. Although we never had any of the ingredients on hand to make anything I watched on television, I would experiment with what we did have on hand. I developed my first recipe at eight years old. I opened up a few cans of tuna, cooked some packaged pasta, stirred in some frozen peas, and mixed everything in a bath of shredded cheese, milk, mayonnaise, salt and pepper. To top this casserole off, I crumbled Shredded Wheat cereal over a 9×13 baking dish and dinner was served. My siblings and I devoured my no recipe-recipe and soon I was known as the cook of the family. I learned to bake from my neighbor, Alice (I was actually named after her). She was an elderly lady who never married and we considered her our American grandmother. Her yard was covered in fruit trees and a vegetable garden we looked forward to eating from every time we visited. Every year she would take us kids to the local strawberry, blueberry, and raspberry farms to pick fresh seasonal fruit. She then would bake the best pies and pastries in the world for us to enjoy. Her love of baking and teaching was passed on to me as if I were her granddaughter, for which I will always be indebted. Today my three beautiful children – Abbi (9), Mimi (7), and Eli (2) – and I cook and bake together all the time. From the moment each of them was able to hold a spoon I’ve tried to teach them the basics of cooking and baking, and encouraged them to discover their own way. They’re developing their own creative flare with what they make. My husband Rob and I love watching them explore their potential in the kitchen, burnt cookies and all. I’m an avid home cook and baker. The advice, recipes, and stories I’ll be sharing with you are from everyday moments and experiences – not from culinary training or professional expertise. I believe in being creative, resourceful, and flexible. This is the approach I will share with you here and on my personal food blog: Savory Sweet Life. I’m thrilled to be a weekly food contributor as part of the PBS Parents team along with my partner, Aviva Goldfarb. I’m most looking forward to hearing your stories, recipes, tips, and ideas of food you love and how you incorporate it into your daily routine. My hope is that we can become friends- learning and growing from each other. I don’t have all the answers but I’m more than happy to share with you what I do know. I also plan on reaching out to the PBS Parents Kitchen Explorers community for your ideas and perhaps even showcase them on one of my weekly posts. I invite you to become an active participant in our newly launched community. Together we will laugh, commiserate, and share family-friendly food our families will love and enjoy! 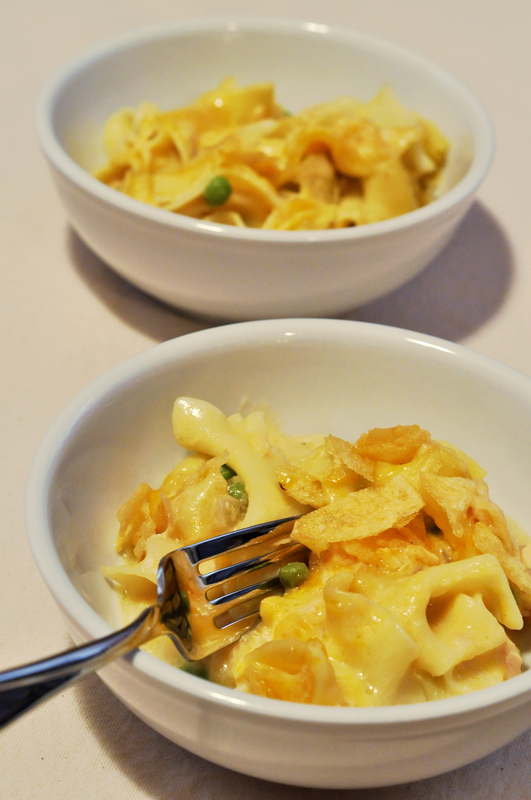 Reminiscent of my childhood, here’s is an updated version of my tuna noodle casserole recipe. I hope you enjoy this recipe as much as we do! BAH Note: I am a sucker for tuna noodle casserole. It is one of my most comforting guilty pleasures. There, I feel much better getting that out in the open. Cook noodles in a large pot of salted boiling water according to package directions until al dente. Drain noodles and set aside. Sauté onion in butter in a 12″ heavy skillet over medium heat for five minutes. Add mushrooms, celery, and salt and cook for five minutes longer. Stir in water and bouillon cubes. In a small bowl, whisk milk and cornstarch until completely dissolved. Add the milk mixture and 3/4 cup of cheese to the skillet and stir everything until well incorporated and sauce is nice and thick. Add noodles, peas and tuna and gently fold them in. Season with pepper and additional salt to taste. Sprinkle remaining cheese and crushed potato chips evenly on top. Bake for 25 minutes or until golden brown on top. I love the story that accompanies this recipe…the best recipes come from someplace deep in the heart. Congrats, Alice, on your new gig at PBS Parents! I love the story… so sweet. sniffle. i don’t know why but this particular food memory post got me all sorts of weepy! the grown up version looks loverly but i bet the 8yr old version is just as great. Lan, I loved Alice’s memory about tuna casserole too. In addition to being a fabulous person, she’s a great story teller. What a comforting recipe and story. I never understood why tuna casseroles got such a bad rap. My sisters and I would cheer every time my mom made one. Ali, I think the tuna noodle dissing is probably due to the “humble” nature of the dish. That’s a shame because tuna noodle casserole is a big bowl of comfort. I may start cheering the next time I decide to make it. Thanks for that inspiration. I love tuna casserole too. This has a lot more to it than my mom’s version though… but I love the story that goes with it. Fuzzy feeling. You know Brooke, that post does feel like a big bear hug doesn’t it? And it give me a perfect reason to buy a bag of chips! With regards to the ingredients, I made it without mushrooms, onion, or celery and it was still perfectly lovely. By the way, thanks for doing that giveaway! I can’t believe I won. I think I’m on a lucky streak right now because this is the 3rd giveaway I’ve won in the past 30 days, and I don’t even enter that many things! Jenna, I hope you’ll try the tuna noodle casserole and become a lifelong convert. Congrats on your giveaway wins. Can you send some of that luck my way? And I want to know what you think of the flavors you chose once you’ve had a chance to sample the goods. Even though I don’t remember eating it much, I love tuna noodle casserole! It’s so comforting. Alice, I’m impressed that you came up with your own recipe at age 8. Using crumbled shredded wheat as the topping was so resourceful. Also, I think the writing here is just beautiful. Thank you for sharing! What a wonderful story, thanks so much for sharing it Alice. I love that this environment inspired you to create and enjoy food. I love Alice and I love this story! I’m kind of scared of tuna noodle casserole though – it was never made in my family growing up and my husband has made me swear never to make it for him. Jennifer, I don’t know what to say except that maybe you can try the recipe one day the husband is away? There’s nothing to be afraid of…tuna noodle casserole is easy. What a beautiful post. I think we sometimes forget what it means to cook frugally, especially when we have a love of food that makes … okay, me … want to delve into the specialty items at the grocer and I always have to remind myself (maybe not always..) that boots for my kids cold feet are more important than whatever extraordinarily expensive food item I’m sighing over. That being said, I remember my babysitter making me her version of tuna casserole and I loved it, especially since my mom though she was a great mom, not such a great cook. Looks like I know what we’re having for dinner tonight! Joy, I know that I am guilty of forgetting that simple food can be every bit as satisfying as all of the fancy schmancy recipes that I aspire to create. Hope you enjoy Alice tuna noodle tonight! you know I love Alice for all the reasons you’ve mentioned above and honestly, Tuna casserole is one of The Professor’s favorite meals. In fact, I’m heading to the kitchen cuz’ I think I have everything I need to make this dish! Debra, I wish everyone had the chance to meet Alice and discover what a fantastic person she is. At the very least, they can try her tuna noodle casserole. I’m not even sure how to respond to this post and all the nice things you had to say. Trying to digest it all. Thank you for featuring this story. Meeting you and all the other BSP food bloggers was definitely one of my highlights this year. I hope our paths cross again soon. Alice, it has been such a pleasure to meet you and to get a glimpse of the person behind the blog. I’ve got my fingers crossed that there’s a BSP reunion in the cards for 2011. People really seem to connect to this story. As The Kitchen Witch commented, the best stories come from the heart and it’s obvious that’s where this lives in you. My daughter will loe this!